We all know the old adage “measure twice, cut once.” But at Eaglestone, we’re all about progress: our new FARO 3D Laser Scanner lets us measure up to 976,000 data points every second! The high-accuracy scanner captures a detailed 3D image of any facility, providing accurate renderings of the space for seamless equipment integration and installation. At Eaglestone, we know that being off by even one inch is detrimental when designing and installing new equipment. Our FARO 3D Scanner captures your as-built plant environment, including existing machinery, piping, building structures and more. We can then create a highly detailed 3D CAD model and drop in 3D renderings of your new Eaglestone Conveyors and other equipment, ensuring that there will be absolutely no interference or traffic issues. 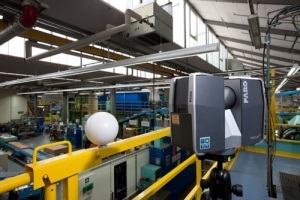 The FARO Laser Scanner is the best in non-contact laser scanning technology. Using a laser beam to reflect off of its surroundings, the FARO Scanner measures the phase shift between the ending and receiving beam. The Scanner doesn’t only look at one angle, but takes both vertical and horizontal measurements to get accurate 360° data. By incorporating 3D scanning into our planning and integration services, we can get your new line up and running faster, saving you both time and money. Contact us for more information or to schedule a demo of our FARO 3D Scanner.